This design is a minor update of the KampMaster or Wild Goose design. The external appearance is virtually identical to the Wild Goose. The overall body length is 12 feet - if building a large 'teardrop', there seems to be little point to go below the length of one-and-a-half sheets of plywood. The chassis is similar to the original - except the longitudinal members are 2"x2" box. 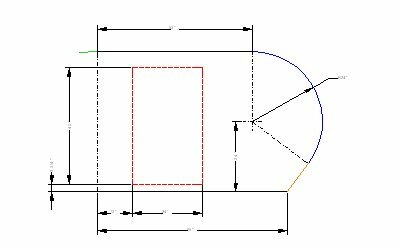 As in the Wild Goose, the transverse members pass below the longitudinals and are angles - there seems little point using box section and then having to add angles for bolting the floor to. While the KampMaster may have been perfectly strong enough, there is very little structure stopping the body from racking (movement of the top from side to side) and that is a large hatch to support on not much! Even if the structure is satisfactory when new, I would be concerned about 'working' of joints in use. To overcome this possible weakness, the front faces of the wheel boxes (shaded black) are continuous from the chassis to the roof and the hatch hinges at this point. This interior layout follows the original Wild Goose fairly closely. The bed/couch is 75" long by 54" wide (ie, regular double size) and has a wardrobe/cupboard (closet) in front of it. 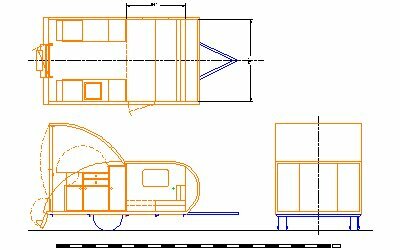 The kitchen units are made as large as possible - this does have the penalty of restricting the view rearward from the bed area (see cross section) compared to a KampMaster. The forward wardrobe/cupboard (closet) seems of little value compared to a wider bed so in this alternative interior layout it has been removed - the bed width increases to 63" at the top of the mattress and another 3" higher up. The folding arrangement actually works - here is the proof! Below are the geometry for the rear and front ends. All views in one zipped .dxf file.